As mentioned before, all functions can only have one y-value for each corresponding x-value. Any continuous graph that has more than one y-value for a single x-value is not a function but is a relation. Let’s start by drawing a function machine. This is a function machine for . When you say of , this means that the function is dependent on the value of . Let’s draw a table which consists of values and values or . So if we put in the function machine, it will come out . The most important thing to remember for functions is for every value, you will have at most one value. Let’s look at this on a graph. We’ll have a straight slash line on the graph. If we look at these graphs, one value has one corresponding value. Let’s do a vertical line test on these graphs. 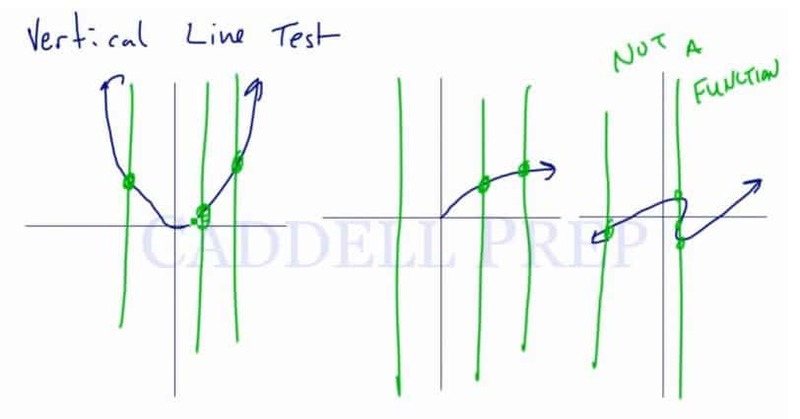 Vertical line test tests if a graph is indeed a function. To do a vertical line test, we have to draw a vertical line at different places on the graph. If the vertical line intersects the graph at only one point every time, then that is a function. Even if the vertical line doesn’t touch the graph, it’s okay. As a rule, we can have at most one value per value. So if there is no value, that’s fine. But we can not have two values at the same time. Let’s draw another graph with a line that has a lot of curves. You’ll see that at one point on the graph, the vertical line touched the graph multiple times. This means for one value there are three values. Therefore, this is not a function. Let’s look at a graph of a circle. If we do the vertical line test here, the vertical line touches the graph twice. So this is not a function. Now, we’ll have a special graph – an absolute value graph. If we do the vertical line test on this one, we will see that the vertical line touches the graph once at several places on the graph. This means this is a function. Remember, for each value there is only one value. Let’s move on to relations. Relation may have more than one value for each value. In and , you can see that value came out twice. Therefore, this is not a function but it is a relation. But if let’s say we change into then this will be a function.